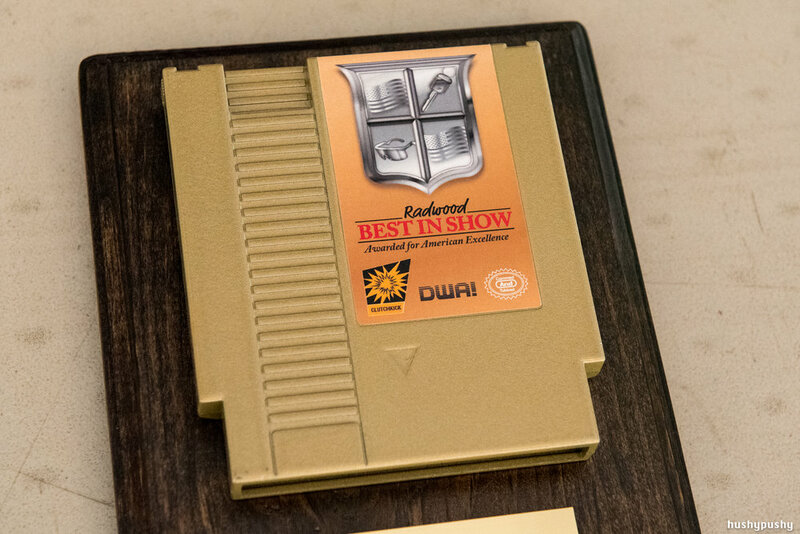 Radwood 2, Anaheim 2017: Ahead to the Past — DWA! 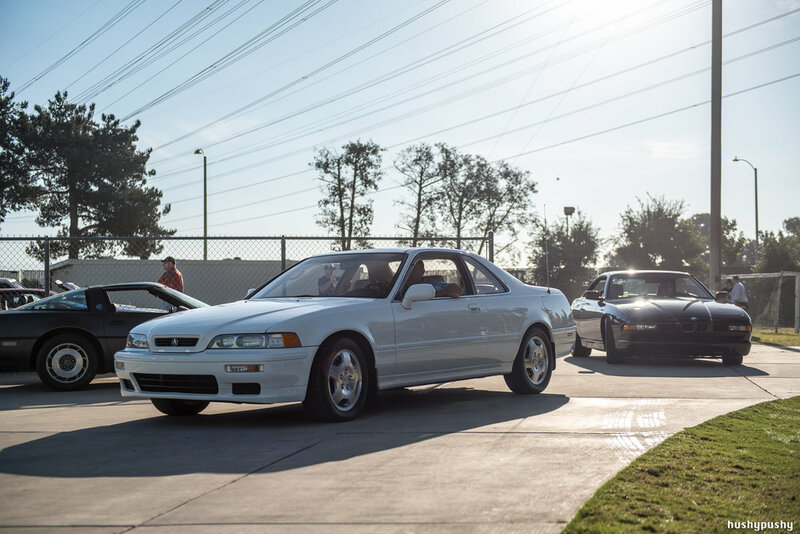 A few months ago, a little event called Radwood happened. 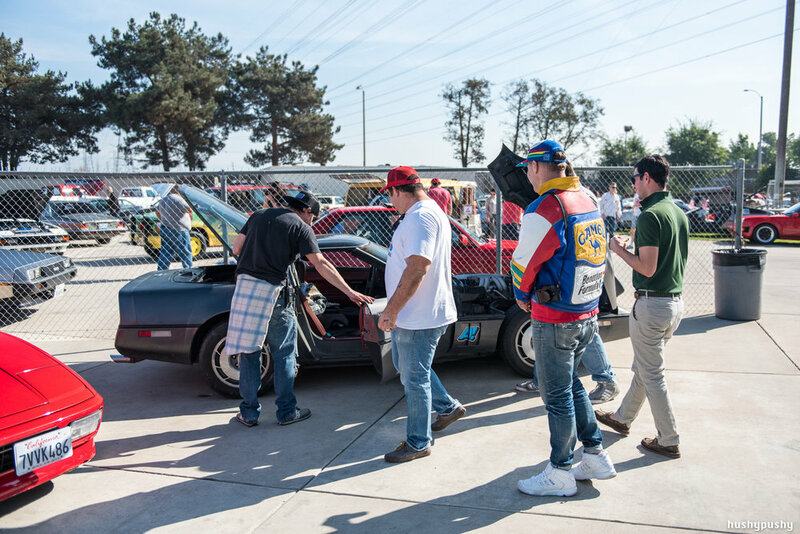 It was essentially a test run to see if people would be into this silly idea: a themed car festival based on 80's and 90's culture. And with the overwhelmingly positive response to that event, there was only one option: to do it again. It would be bigger, better, and sooner rather than later. This show would not have been possible without the very hard work of certain individuals, especially this rock star. Art was already going flat-out at 8:06 AM when I took this snap, and that would be his pace all day. 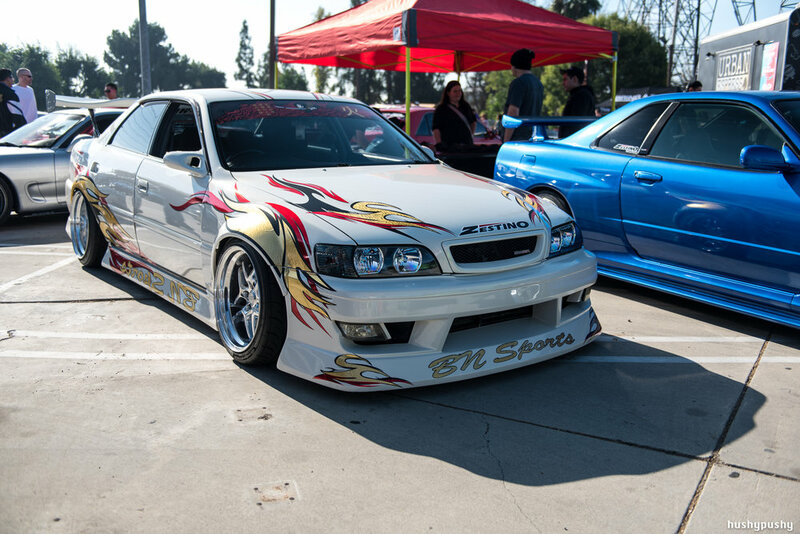 Bryan rolled up in the #ZRNone, and proceeded to empty his trunk for the show. Maybe it's just me, but I thought it would be funnier if left all that crap in there! At this very early point only a handful of cars had arrived. 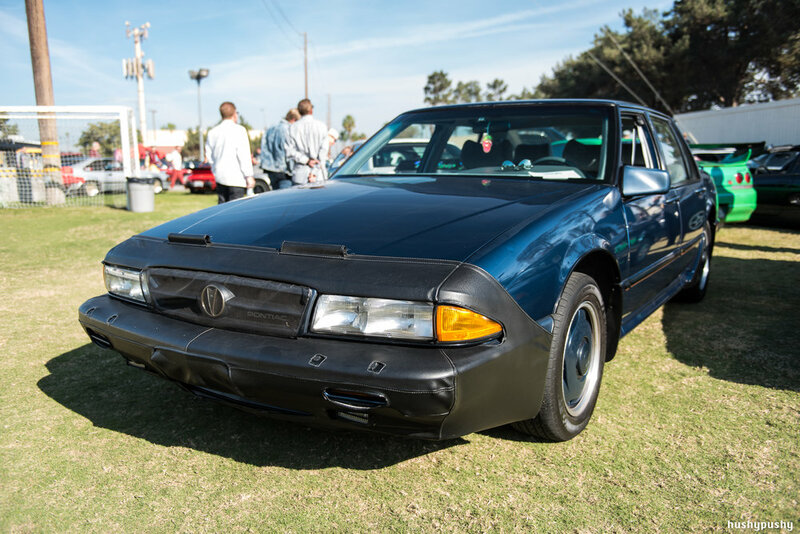 When I saw this lone Cadillac Allante, I knew it was going to be a good show. I went inside and checked out the trophies, which I was seeing for the first time. Cam from Cammed & Tubbed made them, and they were spectacular. 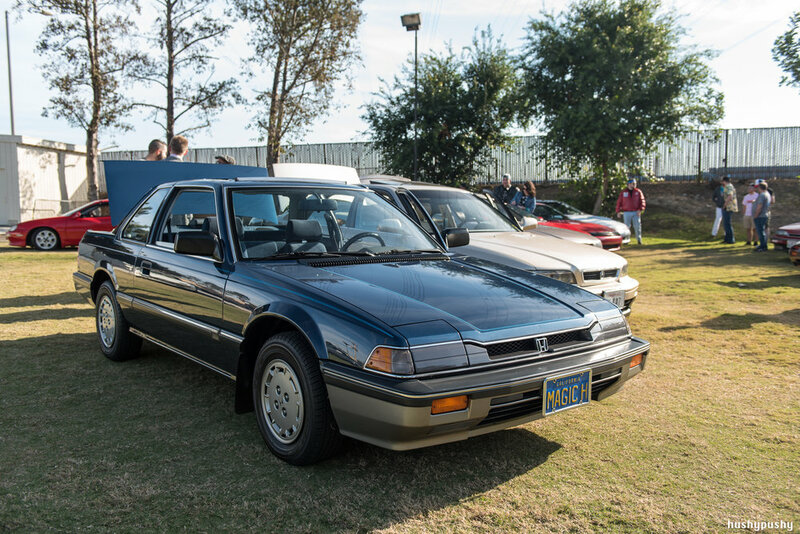 Clarion brought out two of their demo cars, the Acura Legend and BMW 850i. Lane was running around everywhere too, but I managed to catch him in a quick chat with Porsche Punx Jay, who would emcee the BMX demos later on. And of course, a stoic Warren stepped off pit lane to manage the parking situation. At this point, the cars from CMS Motorsports & Restorations moved in. They brought some great cars, but the one that seemed to garner the most attention was this wild gullwing 500 SEC. 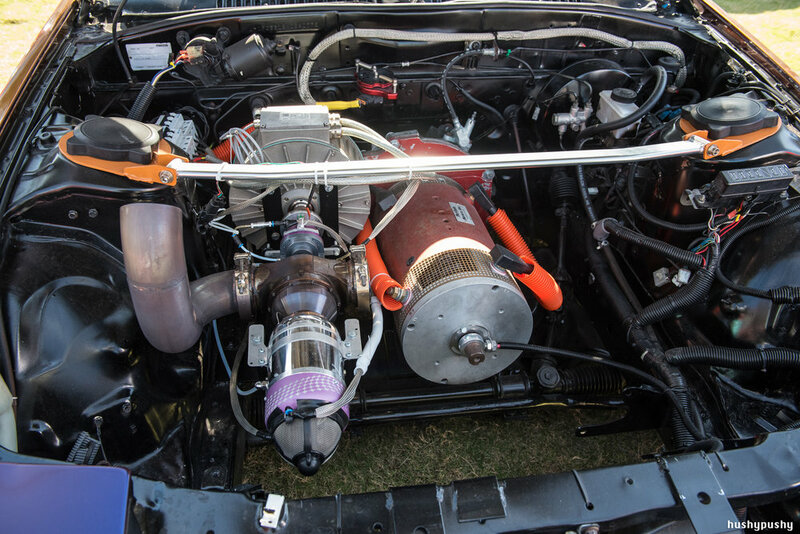 Since the tent was technically an indoor space, running an engine was strictly prohibited. Who needs horsepower when you have man power! 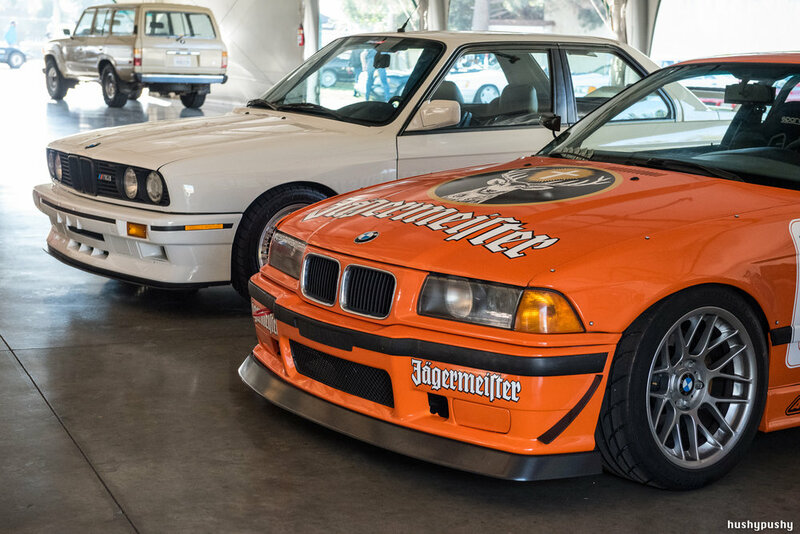 "E36, I am your father." That younger BMW would end up taking Best in Show. 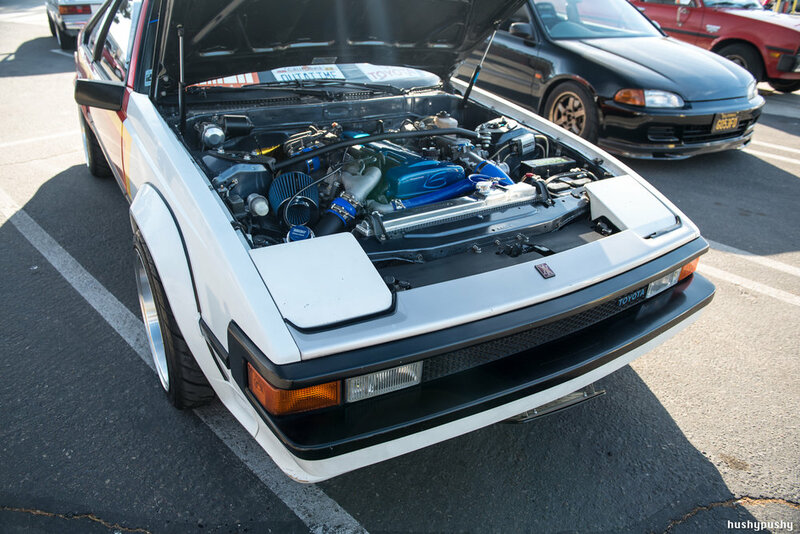 The modification list I saw borders on TL;DR, including everything from drivetrain, interior, suspension and brake mods, to subframe reinforcements, to a complete replacement or modification of most of the body parts, including a slicktop conversion. 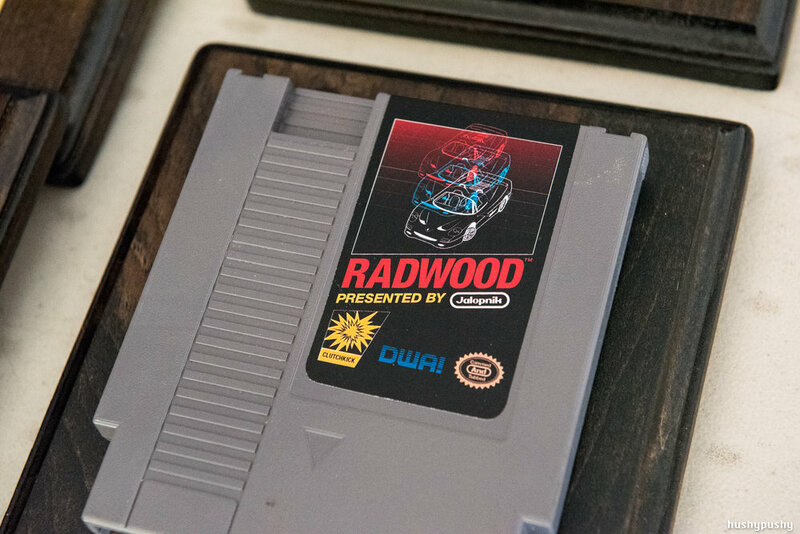 It was a labor of love that was spurred on by Radwood itself--what a wonderful positive feedback loop. 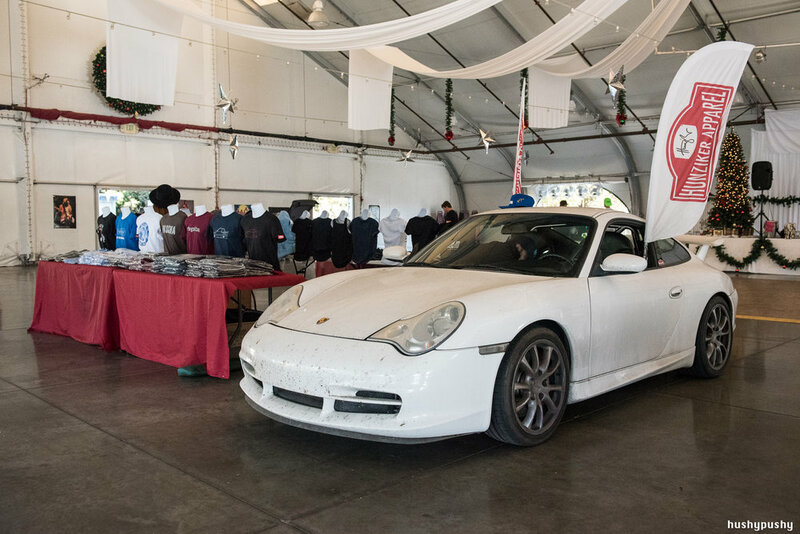 Inside the tent were a few vendors, like Hunziker Design and their 996 GT3. I kinda felt like a jerk, but I needed to protect my wallet, so I purposely avoided the incredibly tantalizing set of wares at the Model Citizen Diecast table. 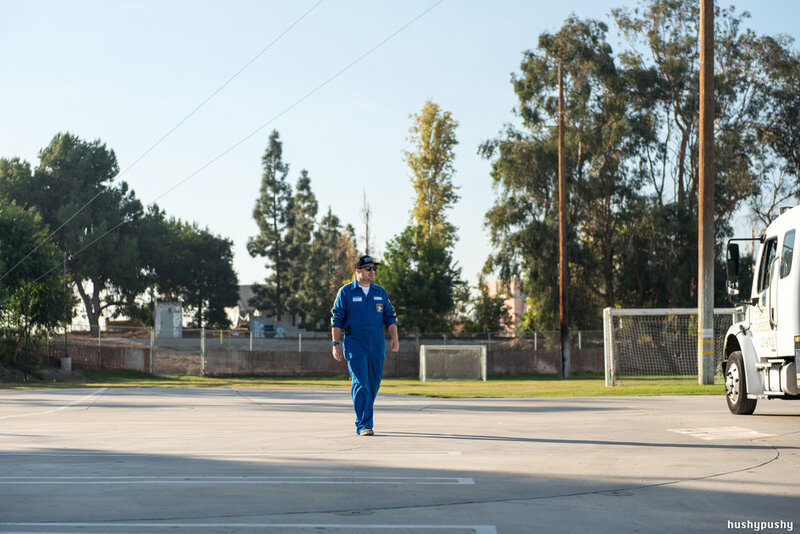 With an empty soccer field in front of us, we were ready. Drew and Brendan were working the front entrance, checking everyone in and stamping hands. Another Rodney Dangerfield! This guy is literally a professional Dangerfield impersonator, and he was hilarious. Our friend Phil, aka @crocgt4, who sponsored the DJ for this event, rolled up in this Vanagon Westfalia, dressed from head to toe, complete with a long wig. In fact, his disguise was so good that Brendan had no idea it was Phil until he saw his name on his entry ticket! 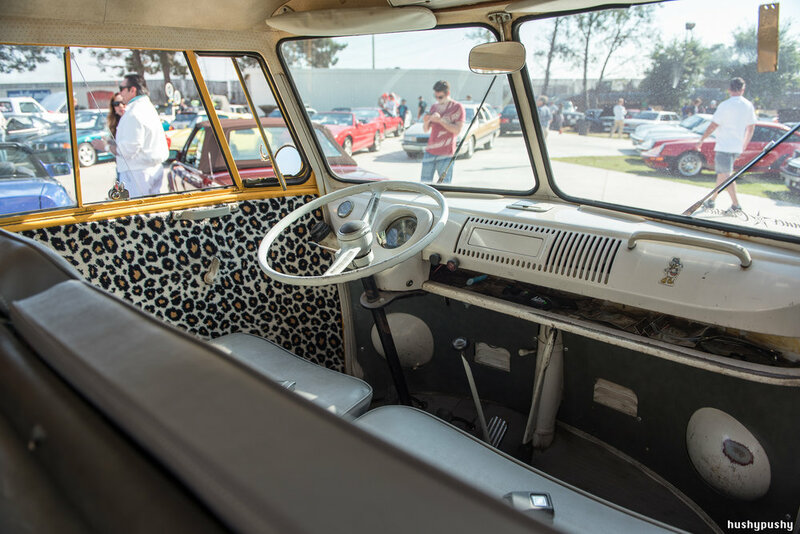 There were lots of different styles represented, as there are really no specific rules for the cars in the show. 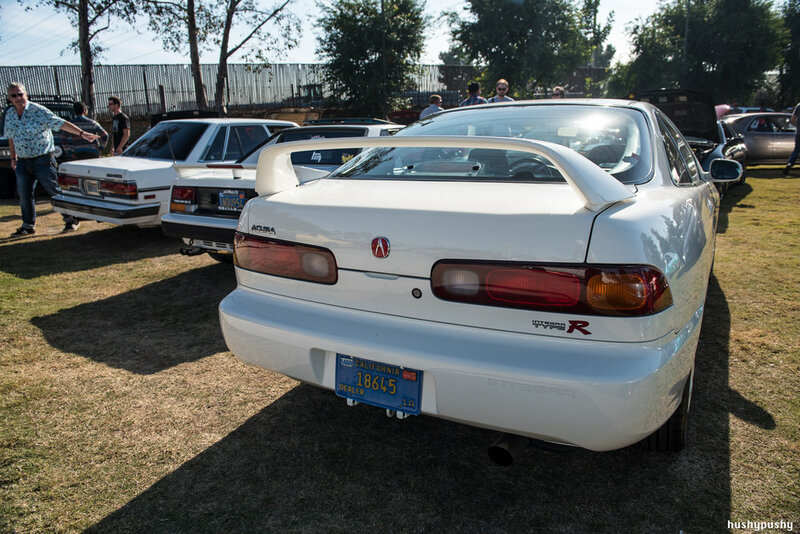 Everything from fully-original to resto-modded cars showed up. This is what I came for: weird gems like the Subaru GL and Mitsubishi Delica. These guys were killing it. 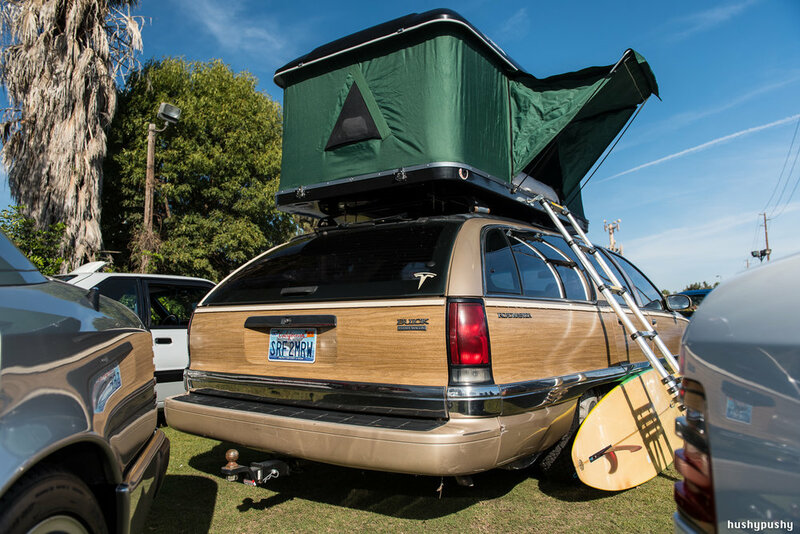 Not only did they have a super clean CR-V to show off (complete with the OEM trunk floor picnic table), they brought a trio of Motocompos, and were letting people ride them around! Cars continued to roll in, and there were gems everywhere you looked. 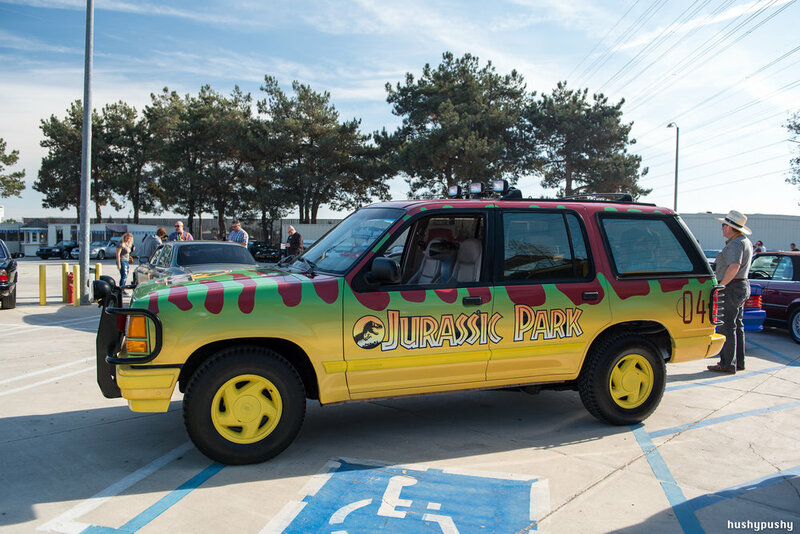 Of course, there were a few movie cars, like this Fast Times at Ridgemont High split window bus, and a Jurassic Park Explorer. And don't forget the 2 Fast 2 Furious Eclipse! Shoutout to our homie Felix, who showed up early and asked, "Do you guys need any help?" to which the answer was a resounding, "Yes!!" He did a great job lining up dozens upon dozens of cars. Thanks! 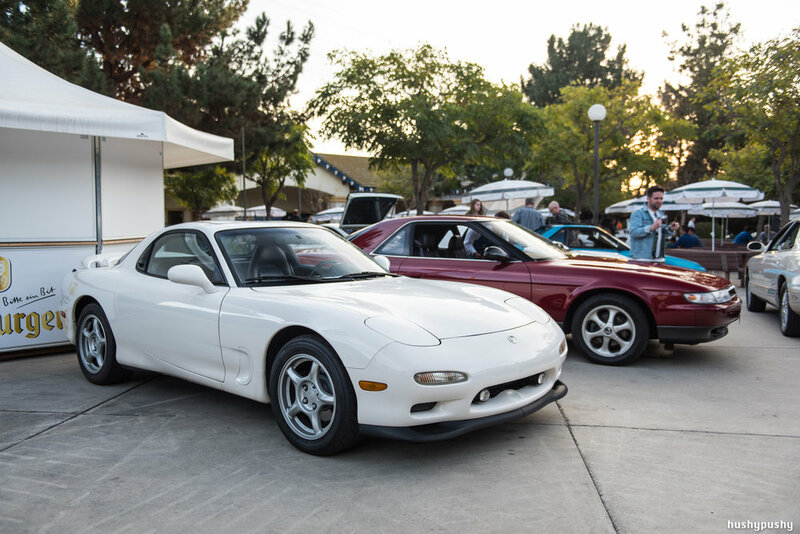 With so many cars in attendance, there was something for everyone. Fancy a European sports car? How about a diesel truck? American muscle? It was all here, and more. 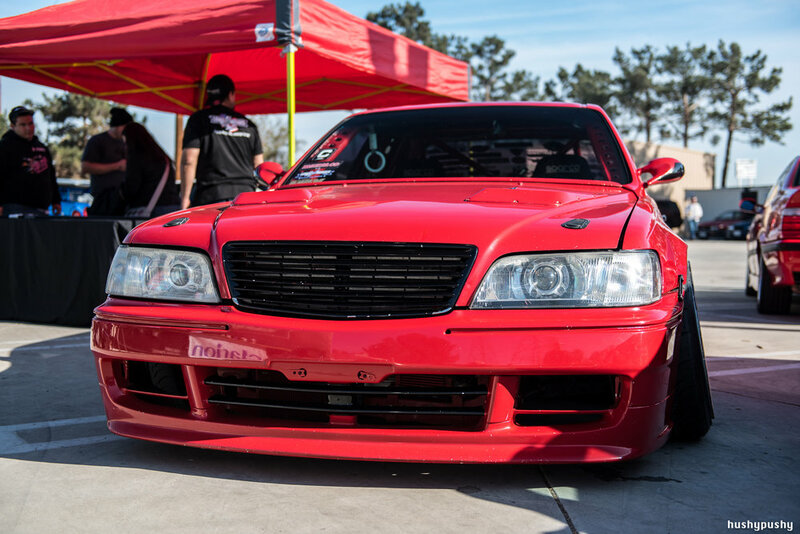 I don't get much exposure to drift cars, so it was really cool to see these builds. And that Prowler! Man, I loved those so much when they came out. There were some cars that made me stop and think, "When the hell was the last time I even saw one of these on the road?" 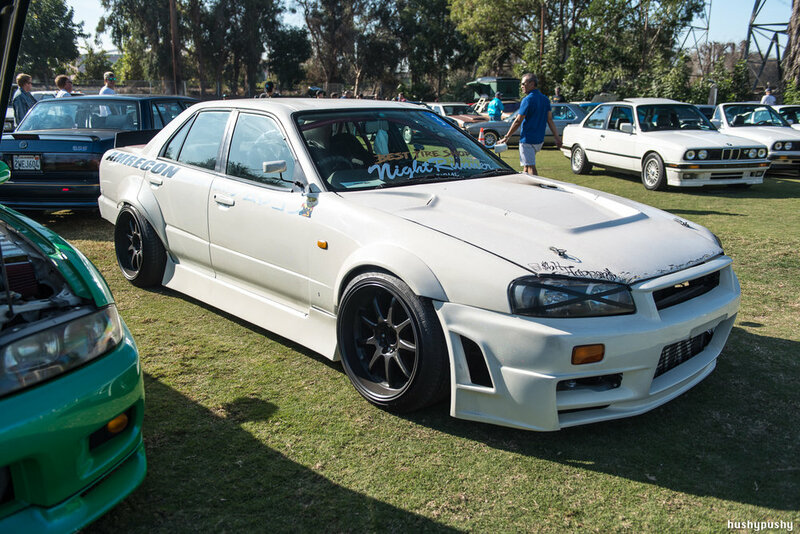 I had the same feeling, but in a completely different way, about these Skylines. 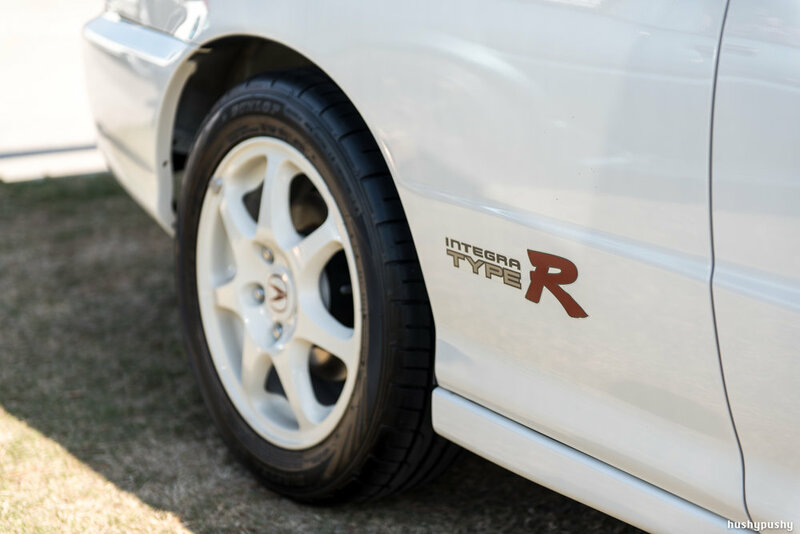 For a multitude of reasons, it's very difficult to legally get an R33 or R34 on the road in California. 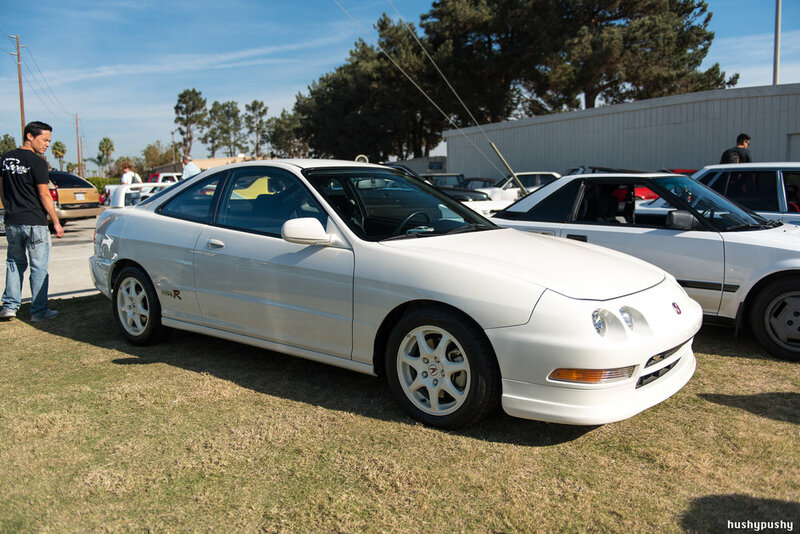 This 1997 Acura Integra Type R was a showstopper. 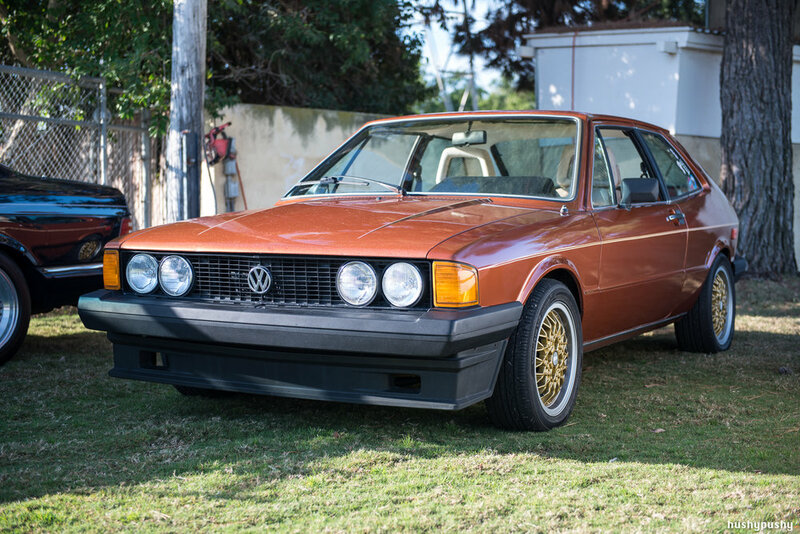 With barely over 10,000 miles on the clock, this very rare first-year model (320 sold) looked like it had just been driven from the showroom. Unsurprisingly, it would go on to take 1st place in the "Best Japanese" category. ...it was wrapped in an equally period-correct LeBra! I remember these used to be everywhere, and then it felt like leather covers fell off the face of the earth. Apparently LeBra is still in business, and according to their website they're "the most recognized name in vehicle front end protection." One of my favorite things was spotting all the interesting license plates and especially plate frames. Remember in the rad old days when it seemed like everybody had a whimsical plate frame? I remember my mom rocking an "I'd rather be shopping at Nordstrom" frame on her Saab 900 back then. And in my imaginary Preservation Class was this very blue Mighty Max interior, complete with cloth bench seat. Back then you got almost nothing in the way of features or gauges, but at least this one did have the pricey optional air conditioning. What was that about whimsy? This looked a fun adventure mobile, with a tent on top and a V8 under the hood. And check out those tires. 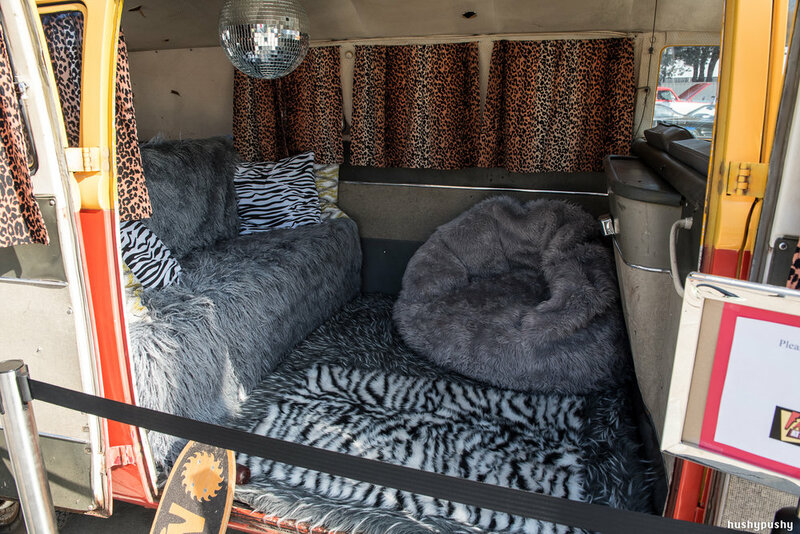 Phil's Turo'd Westy proved to be a huge hit; not only is Phil a down to earth, nice guy, but the cozy spot in the shade proved to be a welcome respite from the surprisingly warm day. It may have been December, but it was also Southern California! 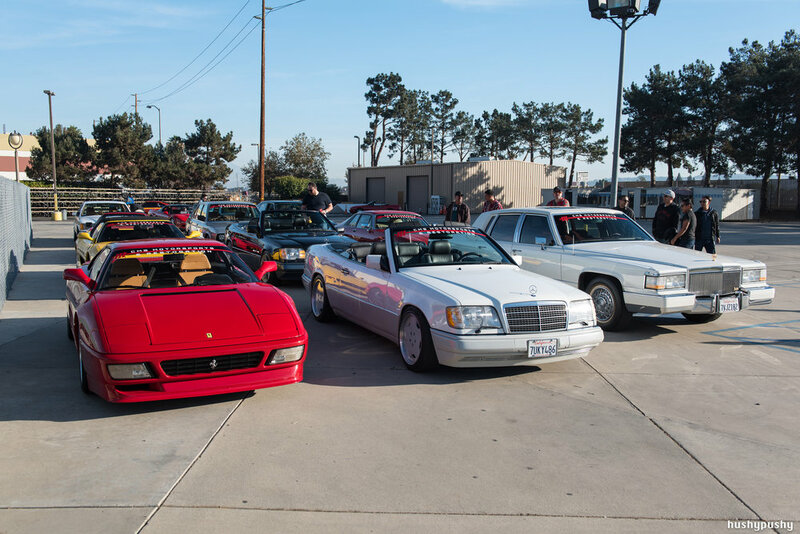 Matt Farah brought four cars, including his flared Fox Body and recently acquired Cassis Red 911. And just so we're all clear, the cardboard you see under every car had nothing to do with if a car leaked--it was simply a requirement from the venue. The cardboard rule applied to every car--and bike, for that matter. Too bad there weren't more classic motorcycles, but these were definitely rad. I was pretty impressed with Mike Burroughs' E28 which was not only built very thoroughly and to a high standard, but was just damn cool. What the hell were they thinking at Audi when they engineered this setup? Such a fascinating packaging effort, but it was clearly effective, given their rally success. Mazda brought out of a few excellent cars, including this Eunos Cosmo, which was an automatic-only luxury GT sold only in Japan. It probably wouldn't be that notable, except it's the first and only production car to ever come with a 3-rotor engine. They also brought out the original M Coupe--the LHD prototype Miata coupe. They sent this one out to a few magazines, and Mazda even ended up making a production NB version a few years later, albeit only for the Japanese market. 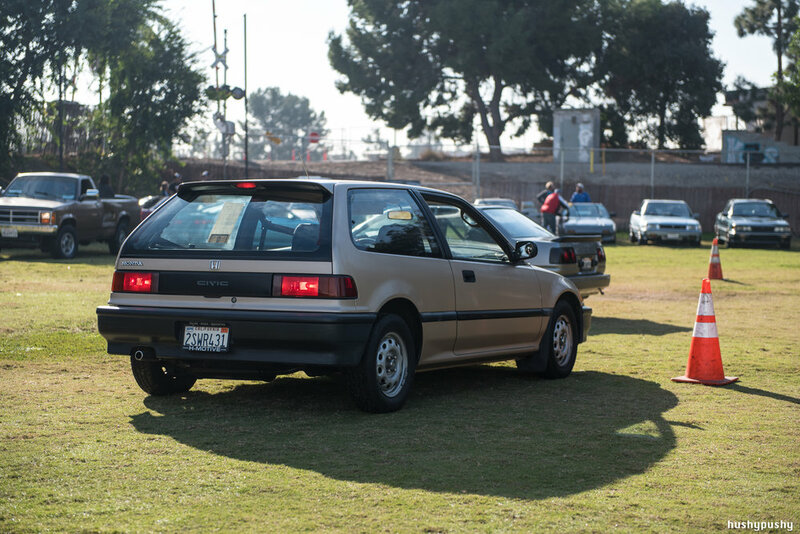 The soccer field that had initially looked enormous ended up jam-packed with cars. 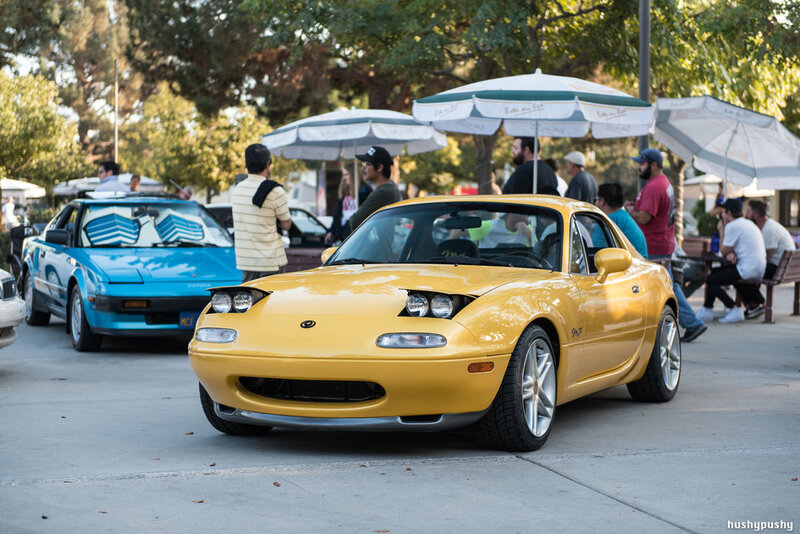 Which banana-flavored sports car suits you--a curvy 3.2 Carrera, or a sharp IROC-Z? From the spectators' outfits to the participants' props, it was an endless circle of entertainment. Spectators were not just here to check out the show, they were part of the show itself. 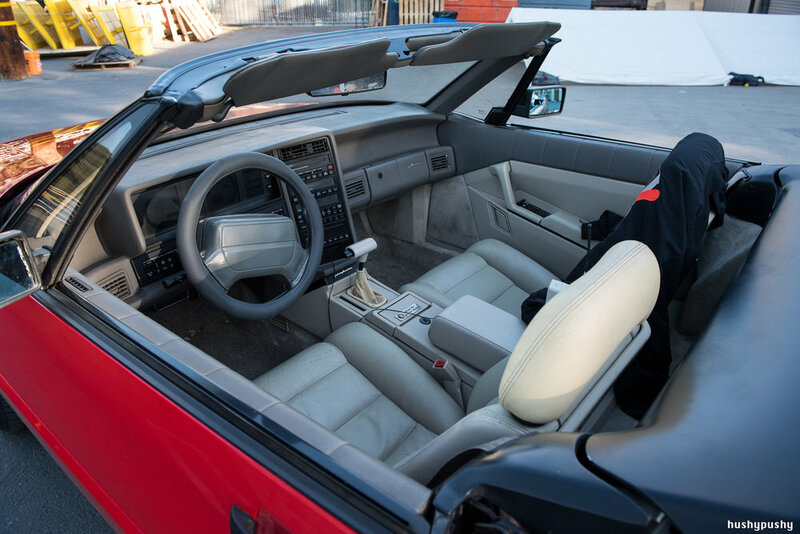 This CRX owner took accessorizing very seriously, with the entire car covered by and filled with period-correct memorabilia. At one point I walked by the ZRNone to find Bryan giving a group tour. That jalopy was a huge hit! When it comes to paint color, this 930 was the easy winner for me. I just couldn't stop looking at the way the lovely mica finish rolled off the sheetmetal. Just look at those curves! It was great to see how stoked everyone was to be there. Walking around, I heard so many good comments and saw a lot of smiling faces. I also saw a few puzzled faces, particularly in front of this wild RX7. It had an electric motor as well as a turbine acting as a generator. It sounded like a helicopter, and it was definitely on the cool side of pure insanity. Cam spent a while running the merch table, which was right next to the DJ who did an awesome job. 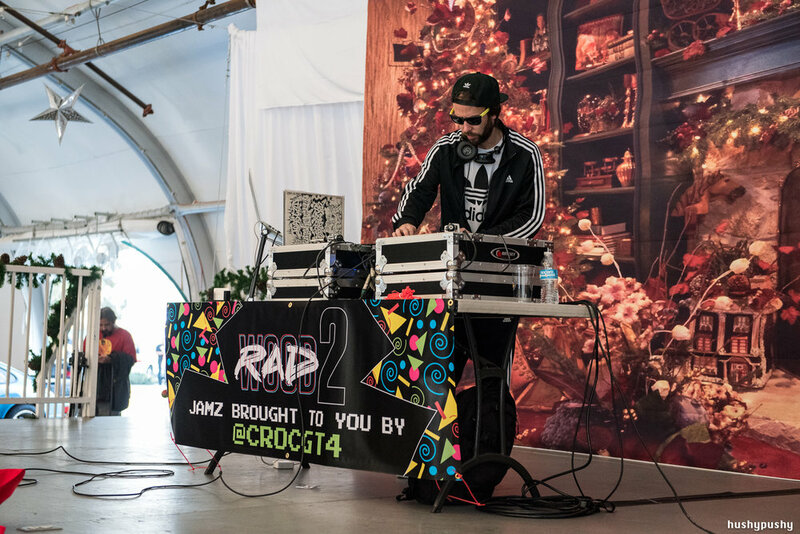 He played everything from Too Short to Sade, and kept a great vibe going. Jay from Porsche Punx was decked out in his old BMW gear, shredding outside. It certainly made an impression on at least one little kid. 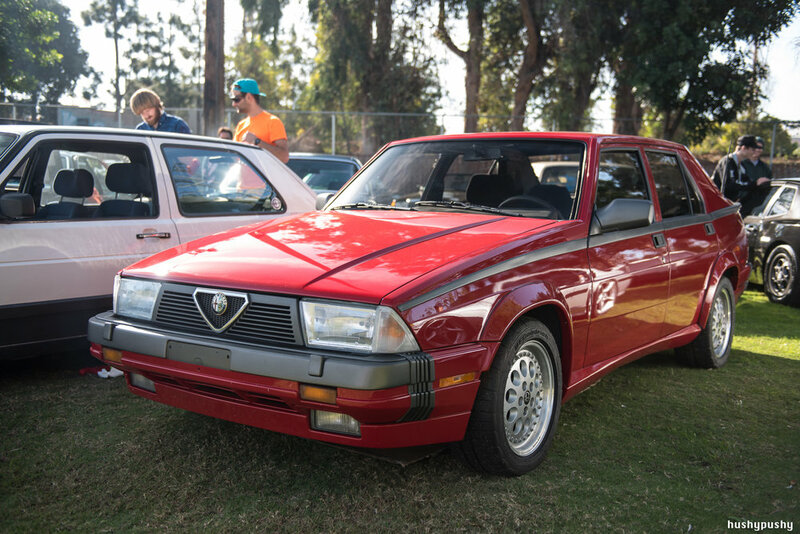 Taking home 3rd place in the "Best American" category was this Chrysler New Yorker Turbo. That interior looks more comfortable than my living room. It certainly made an impression on Lane! Nothing but love for this highway couch. 3rd place in the Best Japanese category went to this "Black Gold" 280ZX. With 9500 miles on the clock, it was immaculate inside and out. 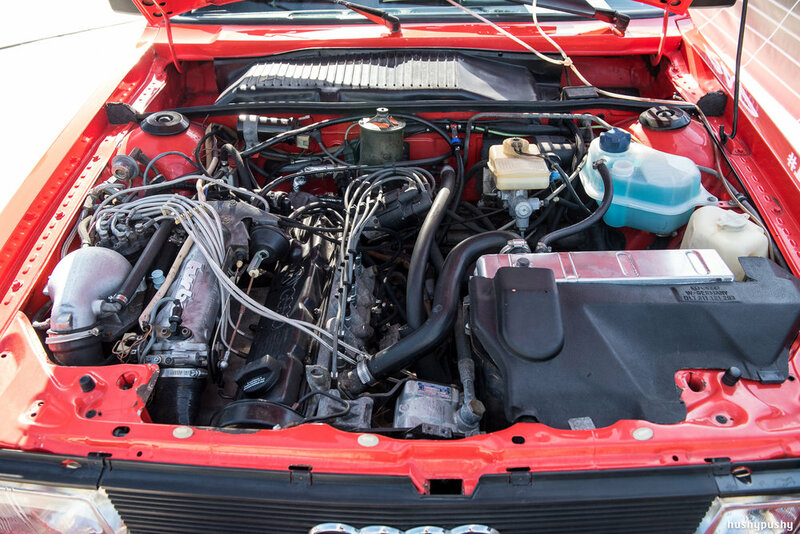 Check out that wild mess of lines in the engine bay! At 1 PM, it was time for the BMX demo. 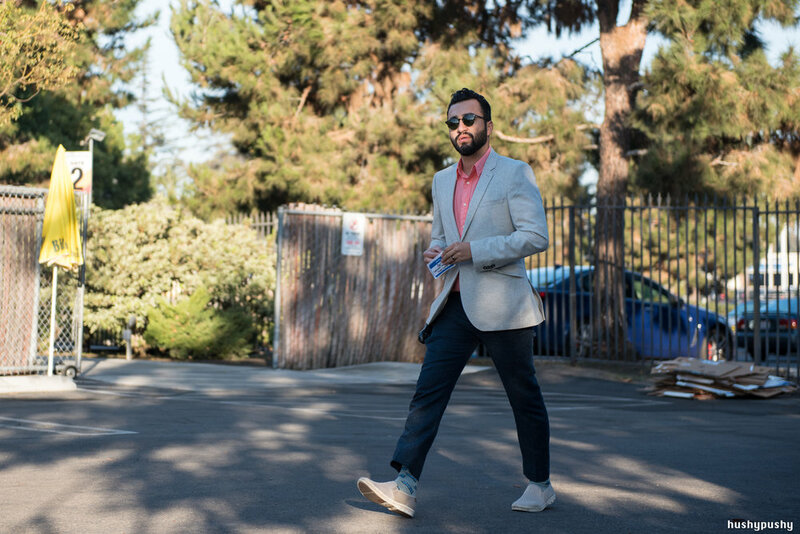 Not only did they bring out the Blazer from the movie Rad, but Martin Aparijo, who was in the movie as well, would be riding along with Chairman factory rider Koit McIntire. A big crowd formed, and Jay was on the mic hyping everyone up. And yes, they did play "Send Me An Angel"! Clean Volvo 240 with a straight six swap; apparently this is common in Scandinavia, although they usually tend to stick a big turbo on it as well. The Peugeot 205 GTI is a car that's received an astronomical amount of hype, bordering on E30 M3 levels. Is it really as good as everyone says it is? Having been through my fair share of modded Honda Civics and Integras, I've always wanted to try a 205 GTI. Another professional artist, our buddy Shahin was on caricature duty all day, pumping out high quality, hilarious artwork. It was at this time that podcast #300 was being recorded. Listening to this episode later, I thought it turned out to be really entertaining podcast, because they kept grabbing random DWAers who happened to be walking by. Including Drew and I! Speaking of walking, at that point they formed the Podcastopus and took the show on the road. As the winter sun made its early descent, the crowds died down and the cars began to roll out. What an amazing day filled with amazing people. 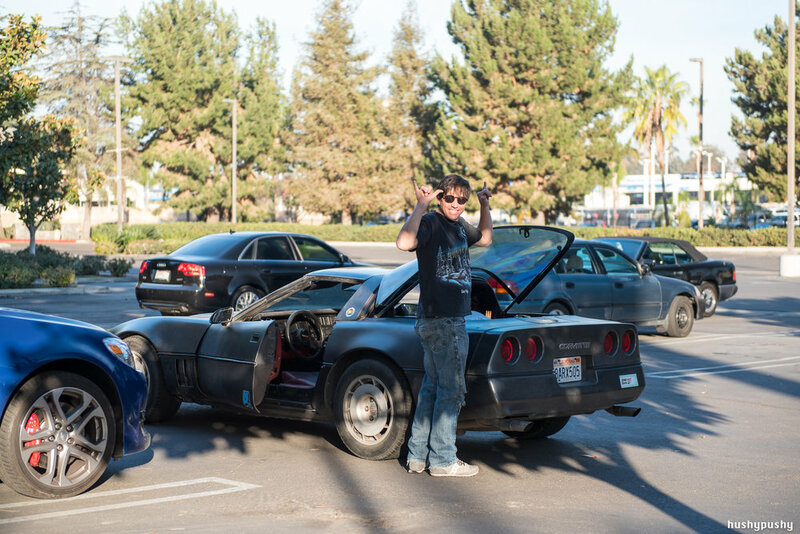 The worthiness of the Radwood concept was well and truly proven, and that bodes very well for the future of this adventure. We can't wait to see you at the next one!